Dessert is served! Participants get ready to savor their Gothic treats. When you hear the word “Gothic,” what comes to mind? Black-lipstick-wearing teens? Cathedrals with flying buttresses? What about lavender pudding or torta bonissima? 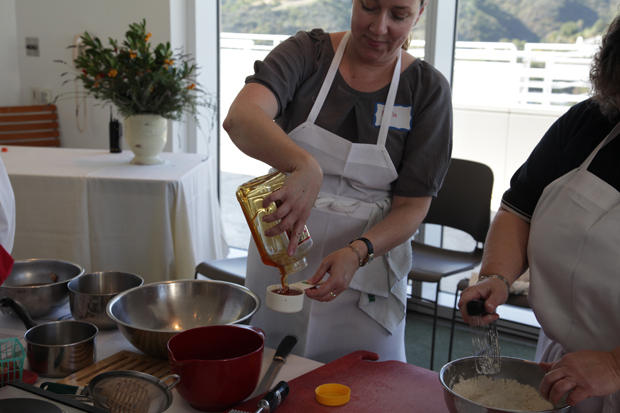 Students at the Getty learned what tickled the Gothic sweet tooth at a culinary course that featured desserts from the Gothic era, where participants were treated to an afternoon of Gothic manuscripts, cooking and of course—eating! 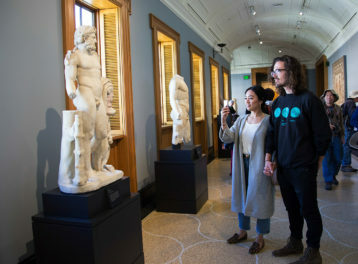 The course was led by Getty Museum educators Nancy Real and Robin Trento. Both spent two months researching ingredients and recipes of the time period in order to create a truly authentic Gothic experience. Participants began the course with a presentation that offered an overview of Gothic culture, including art, architecture, and cuisine. Robin then led a tour of Gothic Grandeur, current exhibition of illuminated manuscripts, which provided the cultural context for the recipes. 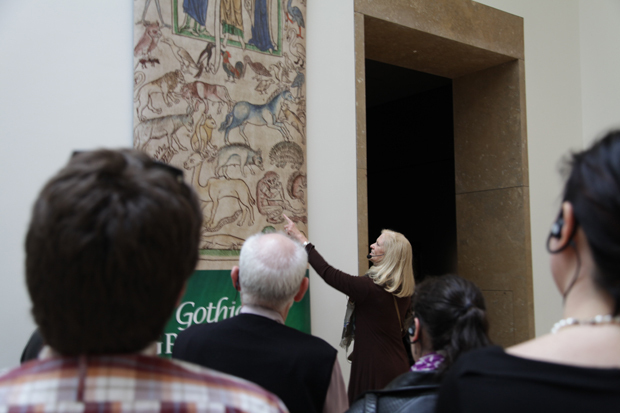 Getty Museum educator Robin Trento provides tour of Gothic Grandeur prior to the cooking course. 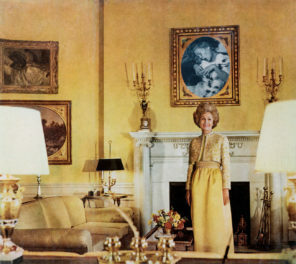 “It’s important to look at what was happening during that time to learn about what was baking in the oven,” said Nancy. 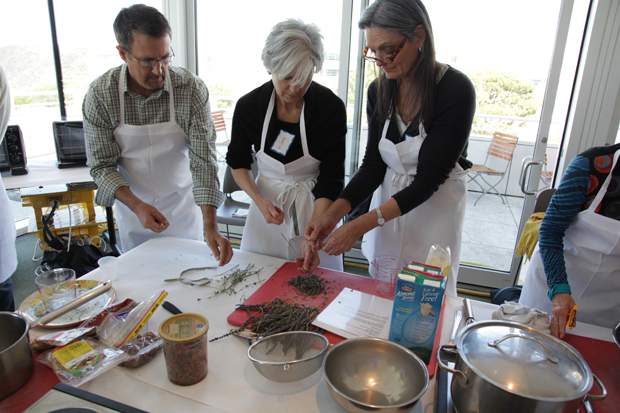 “For example, the Crusades brought a number of new herbs and spices to Europe, and it was important that we include them in our recipes.” In addition to the research, Robin and Nancy also tested the recipes multiple times in their own kitchens, to ensure that the results were perfectly scrumptious. Unlike modern times, dessert didn’t exist as a course at the Gothic table; rather, sweet treats were served throughout a meal and paired with savory dishes like meat pies and roasted fowl. Due to the spice trade and the aforementioned Crusades, items like aniseed, cinnamon, nutmeg, ginger, saffron, rose water, refined sugar, and a variety of dried fruit and nuts were used to create an array of sweet treats. The class focused on recipes of the wealthy, as they were the only ones who could afford these pricey ingredients: one pound of ginger was worth as much as one sheep! 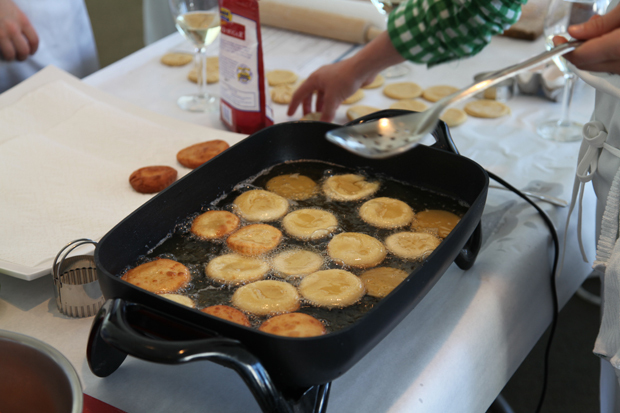 The cooking began with brief instruction, and of course, a glass of wine to enhance culinary prowess. 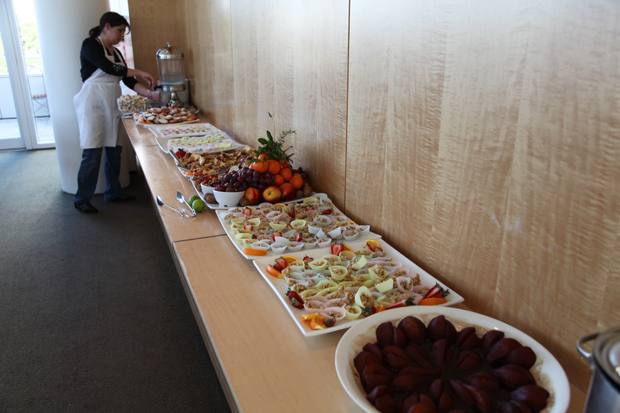 Participants worked in teams to cook the dishes. Here, honey is being poured for the torta bonissima, a walnut cake created in honor of a noblewoman from Modena, Italy, who sold all her assets and gave the proceeds to the poor. Here, lavender is chopped to create a rich, savory lavender pudding. The recipe calls for almond milk, often used in Gothic desserts since it didn’t spoil like cow’s milk. Here sizzling Krapfen, or German doughnuts, are covered in powdered sugar for a fat-laden dish that sustained the faithful during the fasting period of Lent. 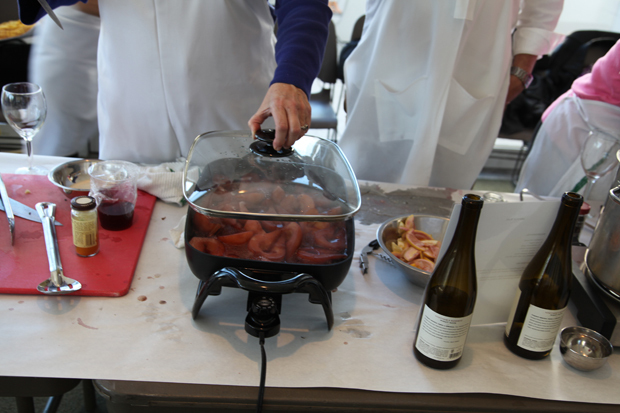 Bosc pears get a red dye-job when cooked in wine syrup. 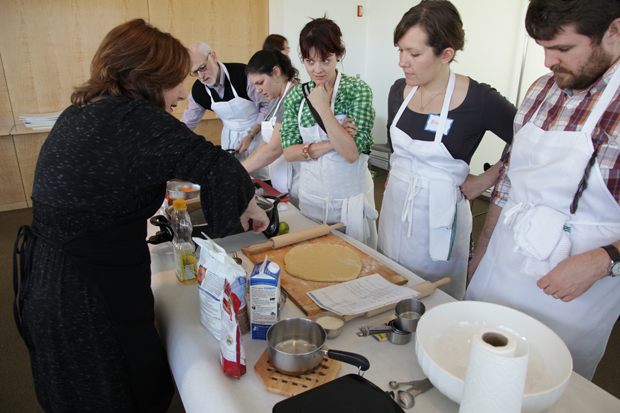 After the cooking, participants sampled their creations around the table for a group feast, and took home a care package of desserts and book of recipes from the day’s culinary adventure.